When we think of the immune system we usually think of the adaptive immune system - the B-cells and T-cells that recognize and destroy specific pathogens – which isn’t surprising since this is the arm of the immune system that vaccines are designed to stimulate. However working alongside the adaptive immune system is the innate immune system which protects us form infection in a non-specific fashion. 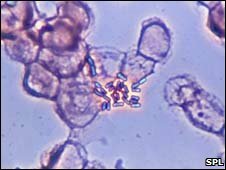 Key to this system are phagocytes, a diverse set of cells whose primary characteristic is their ability to consume and digest invading microorganisms and secrete a range of chemical messengers known as the proinflammatory cytokines which stimulate other components of the immune system. This usually a useful part of the immune response, but sometimes there is an excessive release of cytokines which causes the patient to enter a condition known as septic shock where the immune system over-reacts and causes serious tissue damage, eventually leading multiple organ failure. As a consequence of the increase in complicated surgery, implantable medical devices, elderly patients and patients with weakened immune systems, there has been an increase in the incidence of septic shock in recent years, and with around half of septic shock cases proving fatal it is now the number one cause of death in intensive care units. This week a multinational team of scientists based in Bern, Frankfurt, Glasgow and Singapore, and led by University of Glasgow physician Professor Alirio Melendeza, have published a paper in Science (1) announcing an important development in the struggle to reduce the death rate from septic shock. They had previously used in vitro cell culture techniques to identify an enzyme called sphingosine kinase 1 (SphK1) in human phagocytes and demonstrated using both RNAi and a specific inhibitor of SphK1 called 5c that SphK1 was involved in stimulating the cellular signaling pathways that promote release of proinflammatory cytokines. In this study they began by examining phagocytes isolated from 30 septic shock patients, finding that SphK1 levels were higher in these patients than in a control group. They next found that treating the phagocytes from septic shock patients with the inhibitor 5c blocked the production of proinflammatory cytokines by these cells in response to exposure to bacterial lipopolysaccharide, a molecule found on the exterior of some bacteria that usually provokes a strong inflammatory response. The ability of 5c to block SphK1 dependent inflammation in-vitro was impressive but would the same happen in a whole organism where other pathways might promote inflammation? The team led by Professor Melendez next examined if 5c or RNAi could protect mice which were injected with an otherwise lethal dose of lipopolysaccharide, and they found that both methods of blocking the action of SphK1 did indeed provide complete protection against septic shock. This was a very exciting result but acute, one-off exposure to lipopolysaccharide in vitro or in vivo is not the same as bacterial infection, where bacteria are multiplying and constantly interacting with the immune system to induce inflammation. Of course it is also vital that when turning down the inflammatory response the treatment doesn’t also compromise the immune system’s ability to fight the infection. The team therefore assessed whether pre-treatment with 5c or RNAi could prevent systemic inflammation and mortality from septic shock in a mouse model that simulates microbial infection in humans following surgery or injury, and not only was the immune system’s ability to combat the infection not compromised but the infection was cleared more quickly. Pre-treatment is all very well but in the clinic treatment almost always starts after sepsis develops, so it was cheering to note that the inhibitor 5c reduced mortality when given up to 12 hours after infection it reduced mortality from septic shock, though it was most effective when given within 6 hours. This was as effective as the broad-spectrum the antibiotic co-amoxiclav, a standard treatment for sepsis, and when co-amoxiclav was administered along with 5c the combination was observed to be considerably more effective than either treatment used alone. Professor Melendeza and his colleagues have identified an exciting new approach to reducing the toll from septic shock, hopefully work is already underway to translate this promising study from the bench to the bedside. In other news the 2010 Kavli Prize in Neuroscience has gone to three scientists, Richard H. Scheller, Thomas C. Südhof, and James E. Rothman, who have “used a creative multidisciplinary set of approaches to elucidate the key molecular events of neurotransmitter release”. Their work, which involved the study of tissues from a variety of species including rats and marine rays and studies of knockout mice, has made a huge contribution to our understanding of how the release of the molecules that carry messages between the cells of the immune system work. This research may sit squarely in the realm of basic science, but the understanding of nerve cell communication that these three scientists have provided is now informing the development of new therapies for a wide range of psychiatric and neurological disorders. Both these news items may at first seem unrelated, but what they have in common is animal research at the heart of a multidisclipinary approach that is increasingly typical of how biomedical science is done in the 21st century.